VideoCardz published photos of the Gainward GeForce GTX 980 and GTX 970 as well as MSI's GeForce GTX 970 GAMING. The Gainward leak shows two GeForce GTX 970 models, a reference-based version with core/boost clockspeeds of 1051/1178MHz and a Phantom edition with custom cooling and 1152/1304MHz frequencies. The GeForce GTX 980 is a reference model with 1127MHz core and 1216MHz Boost. The GTX 980 is said to cost 600EUR while the GTX 970 is expected to retail for 400EUR in Europe. 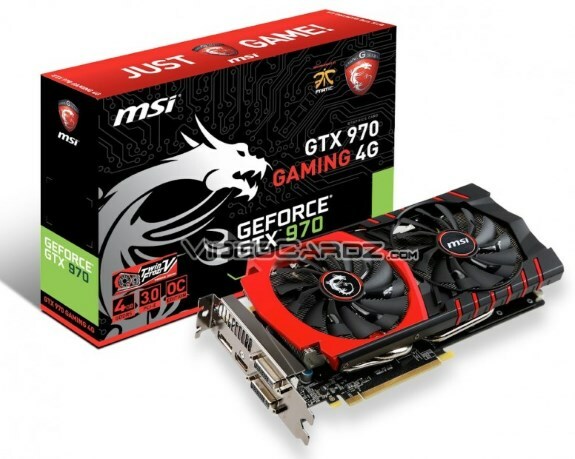 The other leak reveals MSI's GeForce GTX 970 GAMING with TwinFrozr V cooling. This cooling solution has two 100mm propeller-blade fans with a black/red shroud. The card offers a 1140MHz core and a 1279MHz turbo boost. The GTX 970 reportedly has a 148W TDP.